Development and implementation of advanced statistical models for analyzing stochastic dependencies of systemic weather risk can help farmers, agricultural policy-makers and financial agents to address potential risk adaptation strategies and mitigation of threats to the agricultural industry. This study develops copula-based statistical models to provide a better understanding of systemic weather risks with agricultural and weather event data from Australia. In particular, we adopt a C-vine approach to model the joint insurance losses caused by drought events occurring simultaneously across different locations, and consecutively in different growing seasons. This modelling approach is enriched by a clustering analysis process through the multidimensional Kruskal–Shephard scaling method. Daily rainfall data (1889–2012) recorded in sixteen meteorological stations across Australia’s wheat belt spanning different climatic conditions are employed. On a regional scale, droughts occurring in the west are more scattered during the October–December period and for April–June and October–December in the eastern, south-eastern and southern regions. On a national scale, drought events in the east are likely to spread out to the south-east and the south but not to the west. The results also reveal that the drought events in different seasons may not be perfectly correlated. Therefore, we conclude that spatial and temporal diversification strategies are likely to feasibly reduce the systemic weather risk in Australia. In particular, the average risk-reducing effect of the entire insured area across regional, national and temporal scales ranges between 0.62–0.94, 0.48–0.76, and 0.25–0.33, corresponding to 5%- (extreme drought) and 25%-quantiles (moderate drought). 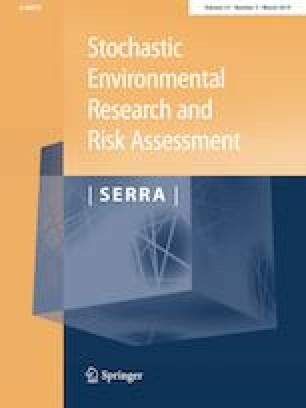 The findings suggest that diversifying risks over time is potentially more effective than spatial diversification. The outcomes may also act as an efficient tool for agricultural risk reduction, but simultaneously, it may also provide immensely useful information for suitable pricing of weather index-based insurance products. The online version of this article ( https://doi.org/10.1007/s00477-019-01662-6) contains supplementary material, which is available to authorized users. The project was financed by the University of Southern Queensland Post Graduate Research Scholarship (USQPRS 2015–2018); School of Agricultural, Computational and Environmental Sciences and the Drought and Climate Adaptation (DCAP) Project (Producing Enhanced Crop Insurance Systems and Associated Financial Decision Support Tools). The authors would like to acknowledge constructive comments from the reviewers.